Around sixty or seventy years ago, American cities planned for the future...cars. Drivability and parking were valued, and urban planning followed suit. Nowadays, trendy cities actually offer quite the opposite...walkability, bikeability, and access to public transportation. Rochester is on point when it comes to craft beer, coffee, and wine trends. But how does our disrespected city fare in terms of the new focus on old school transportation trends? All 5 area schools received a star for meeting an Equity measure by helping low-income students score at or above average on state assessments. The Rochester metro area represents about 0.34% of the American population but 1% of the Top 500 public high schools. Therefore, the region offers 3 times the number of top public high schools than would be expected by population alone...all while providing housing that is 30% cheaper than national average! How can such a feat be accomplished? As previously shown, by large metro area standards, Rochester does a nice job of avoiding the segregation of college graduates from non-college graduates. Along the same lines, Rochester suburbs, which boast some of the highest educational attainment in the country, also provide housing that is cheaper than national average. Despite these facts, Rochesterians somehow feel that we have a crisis of inequality. Without a doubt, the local media's obsession with urban underachievement has fueled this perception. Adding further fuel to the fire are the inferiority complex and hypercritical nature of the native Rochesterian when it comes to home-town analysis. With hopes of quelling the negativity, here is yet more data indicating that Rochester does not have an inequality crisis, at least compared to other large metro areas. 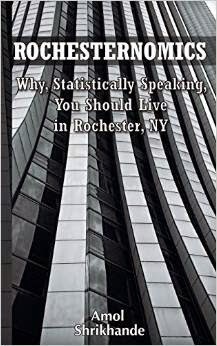 The study, which looked at segregation by income within America's metros, identified Rochester as the tenth least income-segregated large metro in the country. A naysayer might believe that Rochester's performance in this study relates to overall low wages in the region. In reality, the study found that income segregation was only weakly associated with average wages and was not significantly related to per capita income. One would imagine that less income segregation translates into greater social and economic mobility. And if such mobility is not occurring, perhaps we should focus our attention on the immobile parts of the population as opposed to any perceived shortcomings of the region as a whole. According to Zillow, the current home value index in the U.S. is $180,100. In Monroe County, the same index is $127,400. In other words, housing here comes at a 30% discount. As per the Demographia International Housing Affordability Survey, Rochester has the second most affordable housing of 52 major U.S. markets. In fact, Rochester has the 19th most affordable housing of 378 markets in 9 countries. Unlike certain large American metro areas, Rochester does not price out residents in terms of public education. As an example, the suburb of Brighton was recently ranked as the 39th most educated place in the country. Despite this impressive brainpower, the Zillow home value index in Brighton is $165,800...or 8% cheaper than national average! But exactly how segregated is the Rochester metro area? Here is one source that suggests not very, at least compared to other large metro areas. The study, which addressed the segregation of college graduates from those without college degrees within America's metros, identified Rochester as the 8th least segregated large metro. More segregated large metro areas tend to have more gentrification and high-end neighborhoods which price out certain parts of the population. Furthermore, more segregated regions tend to have greater wage inequality. One would imagine that these findings help explain Rochester's relatively affordable housing even in highly touted school districts. So the next time our local newspapers insist on emphasizing the presence of two Rochesters, please feel free to remind them that the two Rochesters are much closer together than the two LA's, two Dallases, and two Chicagos. Rochester has the bones, resources, and intelligence to be like Austin, Texas, and Portland, Oregon. As of this moment, however, the general perception of Rochester is nowhere near that of these trendier, younger cities. Why? Largely, if not solely, due to the lack of a truly vibrant downtown. While downtown is improving and can come alive during certain festivals, it still pales in comparison to the demands of today's young, educated workforce. Because Rochester does not have this curb appeal, Rochesterians (such as myself) have to resort to data-driven analysis to prove why the region is top-shelf. One day (hopefully soon), when Rochester's downtown renaissance is complete, sites like this one will be unnecessary. In the meantime, here is yet more data showing the company that Rochester keeps (at least statistically.) The American Institute for Economic Research recently published its College Destinations Index. The premise behind the research was that the quality of a college education is strongly fortified by the community in which it is received. In order to identify the best college destinations, metro areas were subjected to 12 measures, namely student concentration, housing costs, city accessibility, arts and leisure, percentage of international students, percentage of workforce in innovation fields, unemployment rate, entrepreneurial activity, brain drain or gain, R & D per student, educational attainment, and earning potential. Here is a link to the complete listing of all 75 metro areas. It is noteworthy that New York, particularly Upstate, is very well represented.